As students of Historic Architecture, Culture and Trades we must never be satisfied with unfounded assumptions. Regardless of how long these speculations have gone unchecked we simply cannot take, as fact, the presumptions of those before us without testing and building reasonable evidence to support it or to debunk it, whatever the case may be. For those of you who know me, you know that this is nothing new. This is not some new revelation rather something I have said for many many years. In simpler terms, the suggestions and opinions of others should always be valued and weighed but they can never replace experience and research. Learn from others but learn also from experience and testing. I believe that is precisely what Laura Blokker and her associate Heather Knight have done in regards to bousillage construction in Louisiana. She has taken material samples of well documented bousillage structures in Louisiana and has subjected them to analysis. Simply put, the below information on bousillage is a must read for those currently involved in historical preservation efforts on the Gulf Coast or associated Acadian locals. Unthink what you knew about the composition of bousillage and read this article. A special thanks to Laura Blokker for graciously accepted my invitation to present this data on-line via L'ébénisterie Créole. I look forward to continued cooperation and unified efforts in the preservation of Delta Region Material and Cultural History. I unfortunately had to transition a PDF file into what you see below. I have tried to maintain the format and presentation to the best of my ability. Please let me know if any errors are discovered so that I may correct them. On the cover: Clockwise from left, tacheron trampling Spanish moss into clay for bousillage at Green House by H. Knight; detail of bousillage in Estopinal House by L. Blokker; photomicrograph of Dumesnil House bousillage showing traces of decayed Spanish moss bark by J. Walsh. 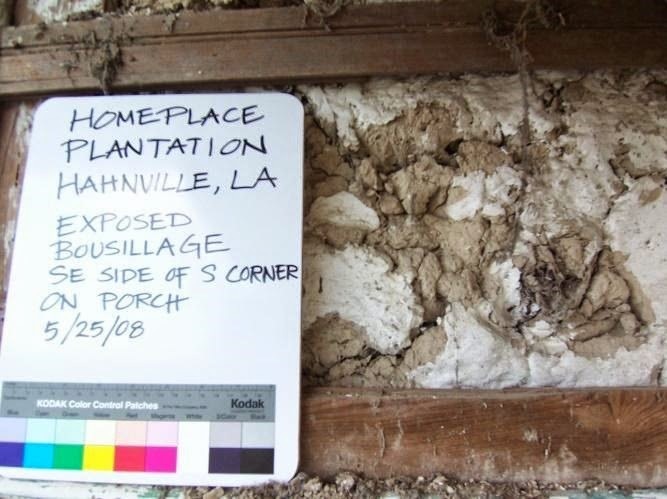 This report describes the work of the 2009 Fitch Mid-Career Grant funded project, “Louisiana‟s Bousillage Tradition: Investigation of Past Techniques for Future Practice,” conducted between June 1, 2010 and May 31, 2011. 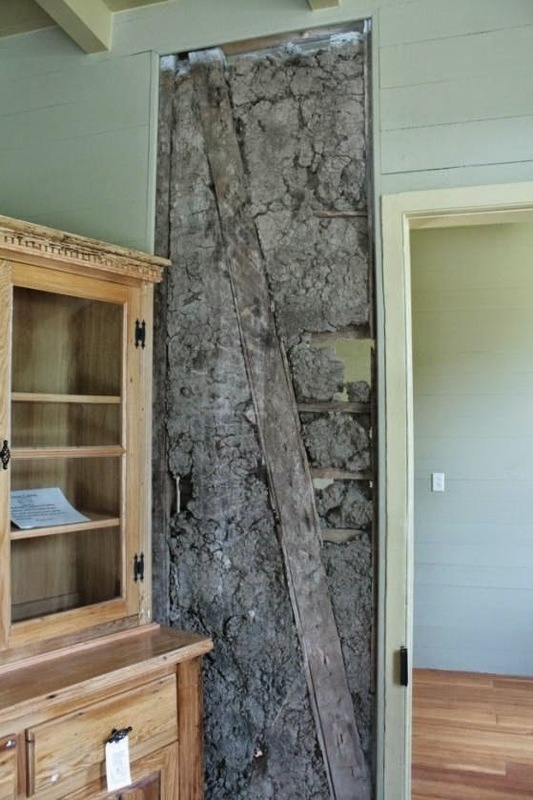 The goal of this project was to gather detailed information about the historic Louisiana building technology of bousillage which could be used to broaden public understanding of the tradition and lead to the creation of technical guidelines for its conservation and restoration. The authors sought to achieve this through an interdisciplinary methodology incorporating collection of local knowledge, close study of building fabric, and laboratory analysis. This work was designed to build upon several years of independent research on this topic conducted by the authors. In spite of the fact that the number of documented extant bousillagebuildings in Louisiana numbers well over a hundred and that there are without doubt countless more undocumented examples, this technology has received scarce attention from scholars and is commonly misunderstood and taken for granted. [b]ousillage is an earthen nogging used in the timber structures of Creole and Acadian Louisiana throughout the eighteenth and nineteenth centuries. Like many construction technologies used in the Americas during the Colonial period, bousillage is based on a European tradition adapted to New World conditions. In this case, the influence of Native American building practices on the tradition was immediate, well documented, and enduring. In 1699, a Jesuit priest, Father Paul du Ru, recorded in his journal the manner in which the different native tribes of the Gulf South mixed the local Spanish moss with mud to make a mortar for building. From that point forward this indigenous recipe was used for the earthen nogging in Louisiana‟s French Colonial, Creole, and Acadian buildings. The proliferate use of this technology throughout the area that is present-day southern and central Louisiana is remarkable when compared with the limited use of other earthen nogging methods throughout the United States. 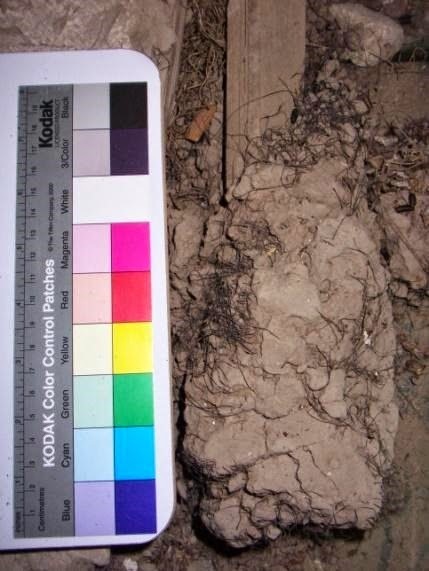 As an earthen construction technique [in North America], bousillage may be second only to adobe in prevalence as measured by the number of standing historic buildings in which it is found. We embarked upon this project with the belief that the proper preservation of bousillage is as important as that of adobe and that a similarly in-depth knowledge of its mechanics and conservation requirements to that which exists for adobe should be developed. With this project, we have gathered some exciting new insights and have successfully moved in that direction. Gulf of Mexico. St. Bernard suffered greatly from the devastation delivered by Hurricane Katrina in 2005, and it was revisited by disaster of a different kind in 2010 when oil gushed into the Gulf from the Deepwater Horizon spill. Colonial settlement in this area began in the eighteenth century, and it is a historically and culturally rich landscape. Because of the threatened condition of this landscape in the face of coastal erosion and climate change, documentation of the few surviving bousillage buildings in St. Bernard Parish was considered a priority. An unplanned field study of another building in western Louisiana came about as part of one of the oral history interviews. The “Green House” or Hebert House, located on the Mermentau River in the Lake Arthur vicinity of Cameron Parish is the southwesternmost extant example of bousillage known to the authors. Thus, through a fortuitous opportunity, documentation of both the southwesternmost and easternmost examples of bousillage was accomplished as part of this project. Fig. 1: Map of primary buildings discussed in this report, by L. Blokker. Photograph of Hebert House by H. Knight, 2011. Photograph of Estopinal House by L. Blokker, 2011. Photographs of sample collection sites, Parlange Plantation, Homeplace Plantation, Mather House, Dumesnil House, and Desfossé House, by L. Blokker, 2008, with the funding support of an Old Salem Architectural Fellowship. Spanish government was executed by a contractor with enslaved builders. The original St.
Bernard church was also reportedly built of bousillage but it was replaced in 1851 due to a fire. The clay of the bousillage is of a light color typical wood affixed to brace, indicated by arrows. thin wood strips. Photograph by L. Blokker. in a photograph of a house with a nogging of thick riven oak slats daubed with mud and straw in Riverdale, New Jersey which appeared in a 1980 issue of the APT Bulletin. According to the author of the query that accompanied the photograph, these strips served to hold the oak slats in place. As the slats in this design appear to be stacked one atop another, it is assumed that there would have been no pockets holding their ends. The query author had no information about this infill technique or even a name for it. The Estopinal House was the only one of the three extant buildings in St. Bernard Parish in which the bousillage is exposed. Because of that fact and limited access, it was determined that the other two buildings would be documented simply with exterior photographs, basic historical information, and locational data. Information about the two recently demolished buildings was also noted. While the lost San Germain and Rodriguez and the existing Messa and Estopinal were all two-bay, side gable cottages of the Isleños Toca Village, Magnolia is a sevenbay Creole plantation house with an umbrella roof. The construction date of the house is uncertain, but in 1794 the property was occupied by a Cuban-born man, Antonio Mendez, whose wife Félicité was of French descent. “Green House,” because it is painted a deep forest green. The bousillage vernacular one-and-ahalf story cottage was built c. 1836, in what was previously Calcasieu Parish. In the late nineteenth century, the state legislature created additional parishes in southwest Louisiana. It now falls in the boundaries of Cameron Parish, close to the Jefferson Davis Parish line. In 1997, it was added to the National Register of Historic Places. The Acadian style cottage was built poteaux-sur-sole, or post-on-sill, with bousillageentre-poteaux, or mud-between-posts as nogging. The colombage frame was hewn with an adze and finished with a hand-plane to smooth the exposed timbers. The frame is mortise and tenon with pegs. The house originally sat on cypress blocks and currently sits on treated pine blocks that rest on individual concrete pads, with a metal damp course between sill and pier. The upper floor garçonnière, or young men‟s quarters, can be accessed through a staircase located on the front screened-in porch. This area was locked and inaccessible during the survey. Originally, this access area would have been an open gallery. Another bed chamber was added to the southwest corner and then the remaining gallery was screened. The upper garçonnière with front exterior stair access and gable roof are both features of Acadian architecture. The house is undergoing restoration, with its current phase addressing damaged sections of bousillage in two areas of the southeast salle. One lacuna is located in the rear, south interior wall under the eight-over-eight sash window. The other bousillage restoration is being completed on the rear interior east wall between two door openings. After its restoration, including removal of a rear 1920s addition, the house now has a rear gallery with three door openings. Originally, the cottage would have probably had two east facing windows, where the two outermost doors reside as partially evidenced in vintage on-site photographs and survey work. Fig. 5: Detail of original Hebert House bousillage and barreau above new barreau. Photograph by H. Knight. The bousillage restoration is being undertaken by Dale Pierrottie of Lafayette. Pierrottie has over twenty years of experience in recreating bousillage. This will be discussed in the oral history section of the report. As a portion of the east wall was open, Knight was able to observe both original and reconstructed barreaux and bousillage. The original barreaux are hand-split and tapered at the ends. At 2‟ - 10”, they are the longest barreaux the authors have documented anywhere. The newly constructed barreaux are machine sawn and uniform in appearance. They are much thinner than the original with one end tapered. 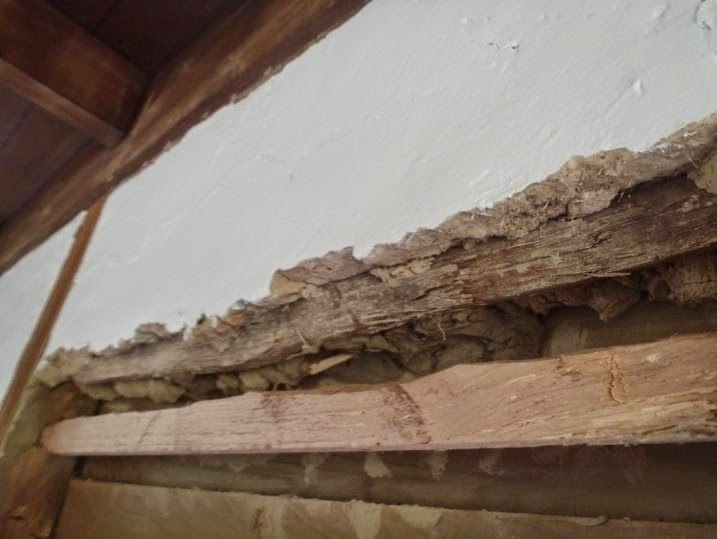 Inactive carpenter bee holes were observed in the rear salle, which can be a threat to the stability of bousillage and adobe structures. The original bousillage is light brown to pale yellow with what appears to be uncured Spanish moss. The Spanish moss is generous in portion in the salvaged original samples stored on the rear gallery. 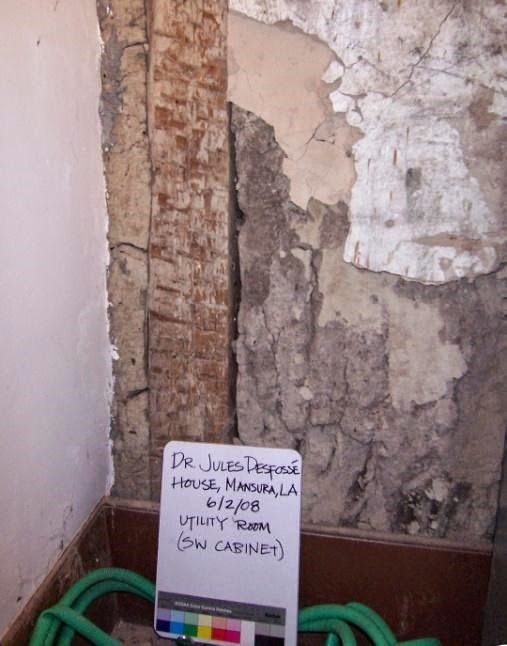 The nogging sample is more than two inches thick and finished with a lime plaster that has been painted with an inappropriate white latex paint. The plaster is flush with the framing and finished with a chair rail. This evidence accompanied with the fact that the timbers were hand-planed smooth means the timbers were purposely left exposed. Research – failed. Therefore, we determined that there was no known superior alternative to John Walsh‟s experience and skill as a microscopist for examination of the moss fibers and that keeping all of the analysis in the Highbridge lab would preserve the limited funds of the budget. Samples of loose retted and unretted moss were provided along with the bousillage samples for comparison. Further discussion of the desired investigation of the material with John Walsh led to the conclusion that qualitative petrographic analysis would be the best starting point for examining the samples. Our top questions regarding the composition of the material regarded the inclusion of anything other than clay and Spanish moss, specifically lime or unburned oyster shell and animal hair. Although historic accounts of bousillage describe just a combination of Spanish moss and clay, a definition of the material that includes oyster shell or lime and deer or other animal hair has become standard; being regularly mentioned in tours of historic properties and appearing in architecture books and even Historic American Buildings Survey (HABS) drawings. While we also hoped to gain a clear picture of the mineralogical composition and particle size distribution of the clay, for which it seemed x-ray diffraction (XRD) might be most effective, it was decided that XRD would be deferred because of the restraints of the budget, and only executed if initial analysis pointed towards a great usefulness of that approach. As noted by Giacomo Chiari in his introduction to the “Materials and Craftsmanship” section of the 2000 Terra conference preprints, the analysis of clays is extremely complex and does not lend itself perfectly to XRD, which is the most common analysis approach, while a more effective technique utilizing synchrotron radiation is prohibitively expensive. In light of this he asked, “is it really necessary to get this type of information?” We asked ourselves the same question, with the conclusion that in the context of this project, the answer was no. With the laboratory and the method of analysis determined, the next step was to select the best samples for study. At the outset of the project seven samples of bousillage were in hand. 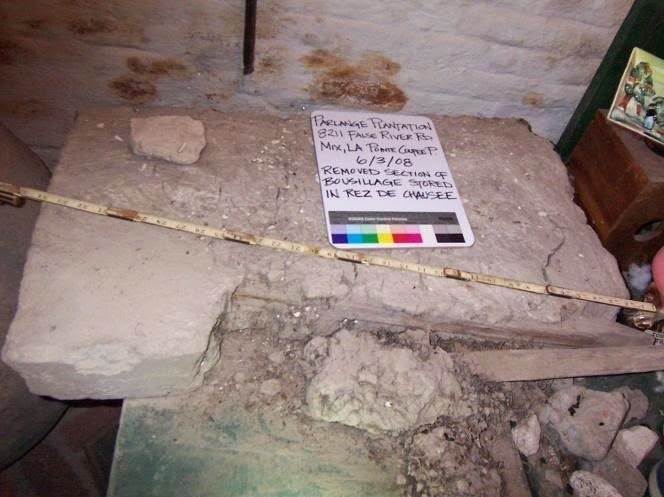 These samples were collected during a 2008 survey of bousillage structures by Laura Blokker, assisted by Heather Knight and Mark O‟Bannon, which was made possible by the financial support of an Old Salem Architectural Fellowship. Of these, three were selected based on the amount of the material, its inclusion of sufficient Spanish moss for examination, and the ability of the three samples to represent variety in geography, age, and cultural associations. Those selected came from Homeplace Plantation, Parlange Plantation, and the Dumesnil House. Figs. 6 & 7 (left): Bousillage in situ at Homeplace Plantation. Photographs by L. Blokker, 2008, with the funding support of an Old Salem Architectural Fellowship. Figs. 8 & 9 (left): Loose bousillage at Parlange Plantation. Photographs by L. Blokker, 2008, with the funding support of an Old Salem Architectural Fellowship. Figs. 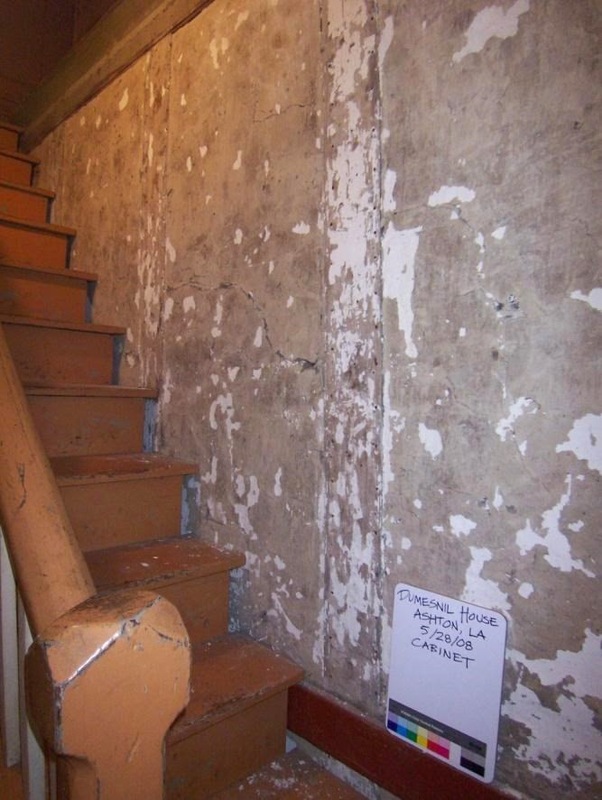 10 & 11 (left and above): Interior bousillage wall at Dumesnil House and detail of cracked bousillage revealed by removal of chair rail. Photographs by L. Blokker, 2008, with the funding support of an Old Salem Architectural Fellowship. Mississippi almost midway between Baton Rouge and New Orleans. by L. Blokker, 2008, with the funding support of an Old Salem Architectural Fellowship. Figs. 14 & 15 (above): Bousillage in situ at Mather House. Photographs by L. Blokker, 2008, with the funding support of an Old Salem Architectural Fellowship. The results of the qualitative analysis of the first three samples provided some interesting findings. As suspected, lime and animal hair were not found to be intentional additives in any of the samples. There was however, discovered in the Dumesnil and Parlange samples, a “very low abundance of fine-grained glass fragments that do not appear to be geological in origin.” The Dumesnil sample also contained some fine-grained particles that were interpreted as dead-burned lime. We hypothesized that these contaminants could have been created by a lime burning process on the site for the mortar required by the brickwork foundations and that they may have been introduced to the bousillage when it was tempered in an in-ground pit. Another possibility suggested by a segment of the interview with architect Eddie Cazayoux is that these particles were part of an ash additive. Mr. Cazayoux stated that he had been told ash was added to bousillage to reduce cracking. 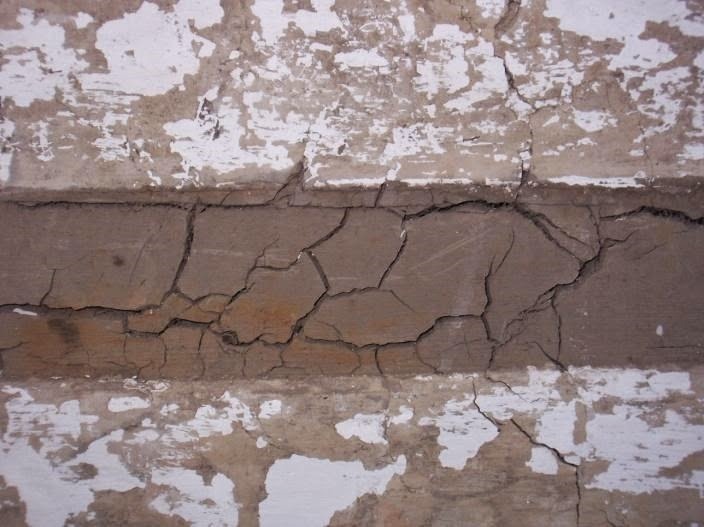 Reduction of cracking in plasters or mortars is typically achieved by slowing the curing process and a variety of materials have traditionally been used as retardants. 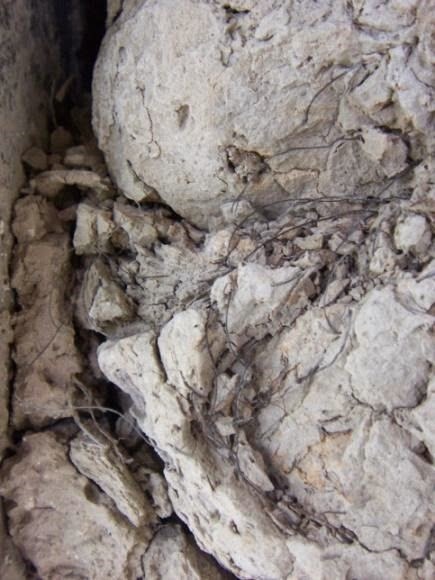 Though ash is well-known in historic masonry as a pozzalonic additive to endow lime with hydraulicity, it is not common in vernacular earthen construction without lime. Analysis of the fourth and fifth samples aided in a comparative interpretation that suggested the glass particles were not likely to be ash, but in fact must be of a geological origins based on the striking similarity between two pairs of the samples. River, a former part of the Mississippi that is now an oxbow lake. Meanwhile Desfossé and Dumesnil are both sited close to bayous. We do not yet know why the Homeplace sample did not share characteristics of Parlange and Mather, as it is located on the Mississippi. Certainly, further exploration and consultation with local soil experts will help to clarify these findings and it is a topic for future work. With this additional data, Walsh concluded that the similarities of the Desfossé and Dumesnil glass particles, which he described as equidimensional, and the Parlange and Mather glass, which was shard-like were too distinct to be the coincidence of contamination. Further, he noted the absence of any truly spherical ash particles, making it unlikely that this was an additive. A questioning of the cured/retted or uncured/unretted state of moss in bousillage first arose between the authors while surveying a building in which the exposed pieces of moss appeared to be unretted. This was contrary to conventional wisdom that states the moss must be retted and led us to investigate the matter in the analysis. Spanish moss is not actually a moss, but rather a bromeliad which grows in favorably warm and humid parts of the southeastern United States. The plant is found growing on trees, which it uses for support, but as an epiphyte, it absorbs it nutrients and water from the air and rainfall. It has a slender stem covered with bark and curly leaves. When it is cured, the outer bark and leaves are removed, leaving the strong black inner stem. Through a careful comparison of the retted and unretted Spanish moss samples with the fiber traces found in each of the bousillage, samples Walsh interpreted the Spanish moss in each of the first three samples as having been added in an uncured state. This conclusion was based on the “many occurrences of decayed bark residues as well as impressions of the outer bark imbedded in the dried clay.” In the second pair of samples, the Dumesnil moss was again interpreted as uncured, but the Desfossé moss appeared to have been cured. 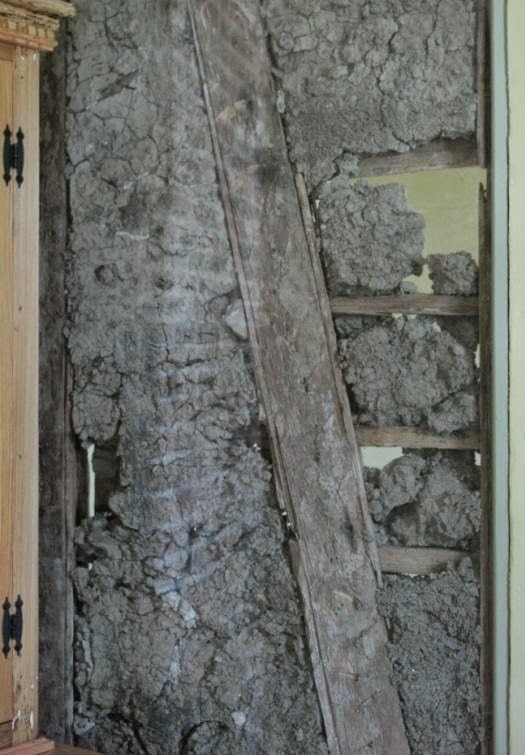 When Spanish moss is piled on the ground, it naturally begins to compost and the bark and leaves decay, so it is possible, that the piece of moss in the Desfossé sample was a naturally cured anomaly which might not represent all the moss in the building. Or, of course, it could be that it was in fact retted for the construction of this house. In either case, four out of five of the samples indicate the use of uncured moss, a fact contrary to the popular consensus about this building method. The tache is a square or round hole for making bousillage. The topsoil is stripped off with shovels. Then the hole is excavated with hand tools and the spoilage thrown to the side. At the bottom is laid a coating of “green” moss and layers of earth are alternated with further layers of moss. Then the whole is watered so as to soak the earth. The men called tacherons, bare-footed and with trouser legs turned up, descend into the tache, treading and crushing the mixture until it is of the consistency of mortar. how has it come about that everyone believes moss used in bousillage must be retted? We have two possible explanations for this. After moss was added to the clay and wetted and then dried in the wall, the bark of the moss would decompose and all that remains visible to the naked eye in most cases is the inner shaft of the moss. In essence, the moss becomes retted in situ and anyone examining a historic building would assume it had been in that condition when mixed with the clay. In addition, it is possible that this impression would have been colored by knowledge of the moss industry that burgeoned in Louisiana during the twentieth century, in which moss was cured for use in upholstery and for other purposes. Memories of how “old timers” used to cure moss could easily attach themselves to one‟s interpretation of this historic building process, but this may have led to a false understanding. Although moss was cured for home purposes prior to the twentieth century, the mass harvest and retting of the material did not occur until the 1900s, long after the peak of bousillage construction. Curing moss is somewhat tedious and time consuming and would have made an already laborious process even more so. Using uncured moss as described in the Anonymous Breaux Manuscript would be much more efficient method, so this finding could have significant practical application in restoration practice. was made to alleviate the Fitch Foundation Board‟s concerns that one of the interviews would overlap the work of a simultaneous project. After work began, it was discovered with sadness that another primary interview candidate, Earl Major, had passed away. The interviewee list was therefore revised to again include an architect and a homeowner. “Don” Moe shared his experience as a bousillage folklife demonstrator on the grounds of Destrehan Plantation in Destrehan, the site of an eighteenth century bousillage Creole plantation house. 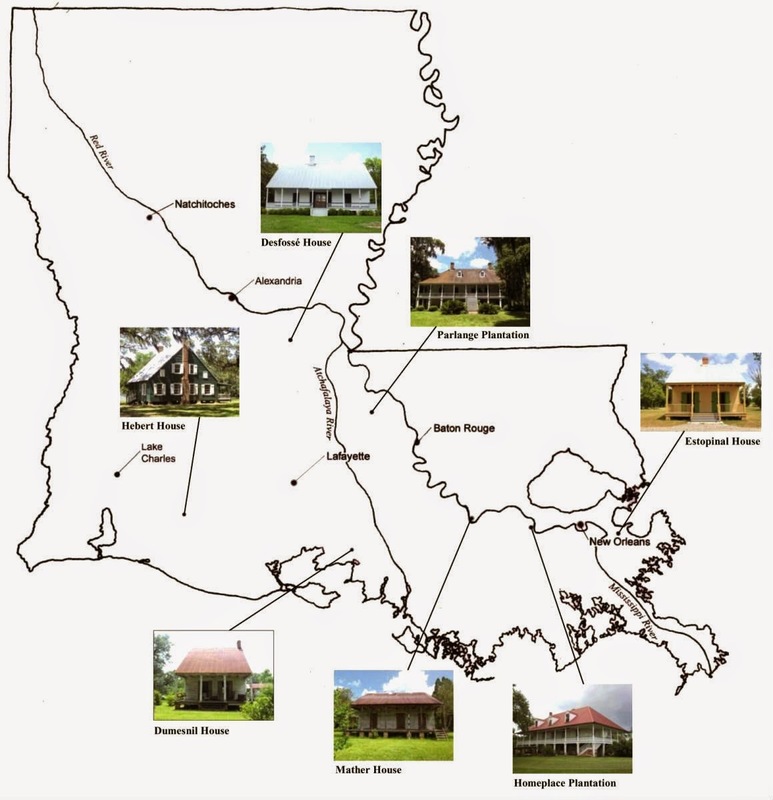 Glenn Wade Lege II recounted the restoration of his bousillage Acadian cottage on January 3, 2011. Russell “Dale” Pierrottie, a self-taught bousillage sculptor, folklife demonstrator, and craftsperson, was video interviewed while working at the “Green House” in Cameron Parish on May 15, 2011. Unfortunately, none of the interviewees learned bousillage technology directly from a seasoned practitioner. All audio, with exception to Pierrottie, was recorded with a hand-held Panasonic Digital Recorder. An Olympus Digital Camera and tripod captured the Pierrottie interview and recorded his work at the “Green House.” Back up audio recordings were made using the Recorder application on an iPhone. Additional short video clips were made using a Canon Digital Elph, Power Shot SD700 IS. Collectively, the interviews provided invaluable information from several different perspectives on the mechanics of working with bousillage. Each interview was guided by a questionnaire created for this project. The questions covered the personal and professional background of each individual, their personal habitation experience related to bousillage and their hands on experience with bousillage. 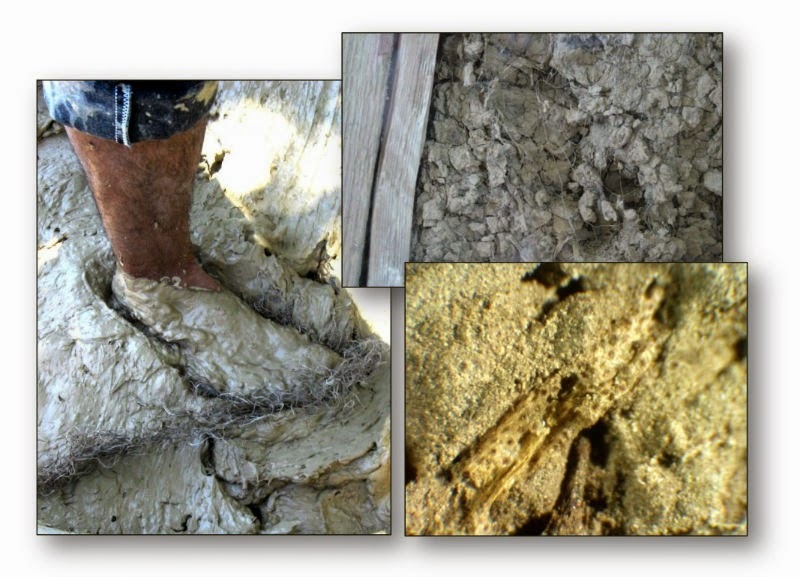 The primary aspects of bousillage construction that were discussed in detail are the clay, the moss, mixing techniques, consistency, and application methods. While some of the information was similar, techniques varied. A special emphasis was placed on discussion of Spanish moss because of the results of the analysis. As delineated in the “Materials Analysis” section, four of the five samples sent to Highbridge for analysis employed uncured/unretted Spanish moss. These findings contradict popular folklore and current practice in which all Spanish moss is cured before mixing with mud. All four interviewees called for cured Spanish moss, but how it was retted varied in description. Pierrottie‟s moss for the “Green House” restoration was previously boiled for fifteen minutes to flash cure it. It was then allowed to air dry and still appeared somewhat green on site, with no black inner fibers exposed. Lege and Cazayoux purchased bales of ginned moss for their personal dwelling projects, while Pierrottie feels that ginned moss is too short and brittle. Moe spoke of and demonstrated curing moss by a composting method. It would be wet down and flipped occasionally and wet again over six weeks, until the outer bark naturally decomposed. Pierrottie also likes this method, when the project timeline permits. David J. W. Floyd, Director of the Louisiana State University Rural Life Museum, commented in a phone interview in December 2010 that “boiling moss would have been too much trouble and that craftsmen would simply have piled it and composted it until it cured. He stated that the moss gin was not invented until the mid-nineteenth century, which is a late period in the historical use of bousillage construction. The author has noted that Spanish moss will self-cure in its natural environment, both on the ground and hanging in trees. Large clumps of green moss, whether deposited on the ground or in trees, will often contain an inner section of naturally cured moss. This was observed at Audubon Park in December 2010 and at the “Green House” hanging from a tree on the banks of the Mermentau River in May 2011. You can dig a hole and bury it in there. [This method] gives you more surface area. Once you set it on the ground, that sets up the decay like you are composting in the garden. It works the same function. But, if you put it into a pile, and you have a large enough hole, you are going to have more surface area [for decomposition]. Moe, Lege and Pierrottie described or demonstrated loosely fluffing the moss before adding to mud. Pierrottie also explained how he sorts the moss to remove short pieces which do not hold the torchons (loaves of mud) together as well as long pieces. In this sorting process, twigs and other material that could cut the feet and hands of the craftspersons during tempering and application are also removed. Two of the interviewees brought up using materials other than Spanish moss in bousillage. Wade Lege mentioned friends that restored their bousillage home using pine needles instead of Spanish moss. The house was out in the Louisiana prairie where pine trees are more prevalent. Dale Pierrottie also noted hearing of the use of pine needles, but suggested that this was probably just done in chinking, not in full wall infill. He further commented on experiments done in the Lafayette area with byproducts from the rice industry as a substitute for moss. Both of these methods deserve additional inquiry and survey of mentioned structures. In 2008, the authors surveyed the Cook‟s Cabin at Oakland Plantation in Bermuda, Louisiana. The bousillage employed at the cabin used straw as a substitute for Spanish moss. The material resembled adobe, yet was still draped over the rabbits or barreaux in a similar manner. 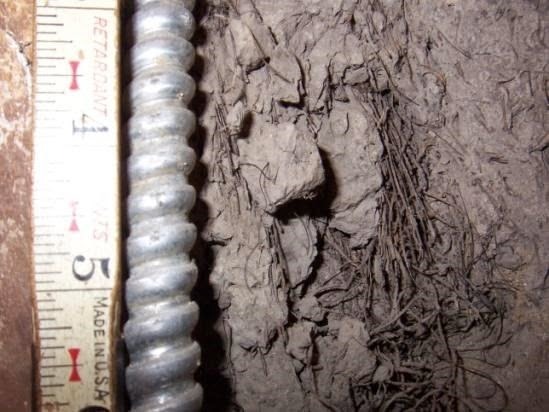 Such alternative fiber materials could offer another green aspect to building with mud in areas lacking ample Spanish moss by virtue of their local availability. 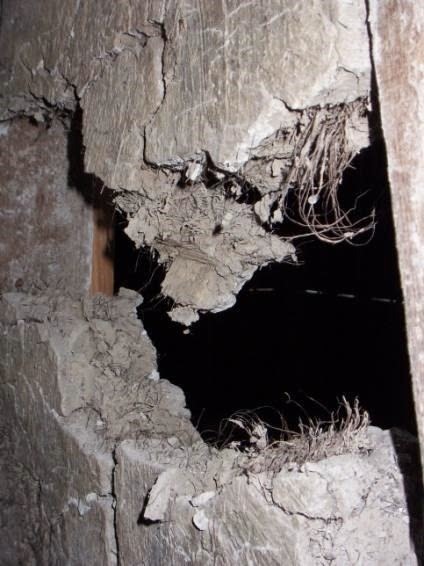 Lege worked with several workers from Central America for one year to restore his home and noted in the interview that they were good problem solvers and familiar with earthen architecture. He mixed his mud and moss on a table so “the work would not be back breaking.” Cazayoux and Pierrottie both employ baby pools as substitutes for pits in which to trample the mixture by foot. Tempering by foot is certain to have a considerably different effect on the consistency of the material than mixing on a table top and might affect the amount of water required and the subsequent curing and cracking. Each of the interviewees had developed slightly different methods of achieving what they felt was the right cohesion of the material before the loaves could be placed in the wall. Moe explained that when the material is first made, it will fall apart and must age for at least a day – preferably two – before it is a good consistency for using. Cazayoux noted that he worked the material wetter and let it dry a little before applying it. He also stated that he would add some extra moss to each torchis before placing it in the wall. Pierrottie focused on the incorporation of long pieces of moss into the mud, but used the torchons almost immediately after mixing. Once you have lived in one of these [bousillage homes] … it is hard to live without a thick wall, well insulated situation, because they do work really well. If I have to build, recreate something, it will be recreated with thick walls. 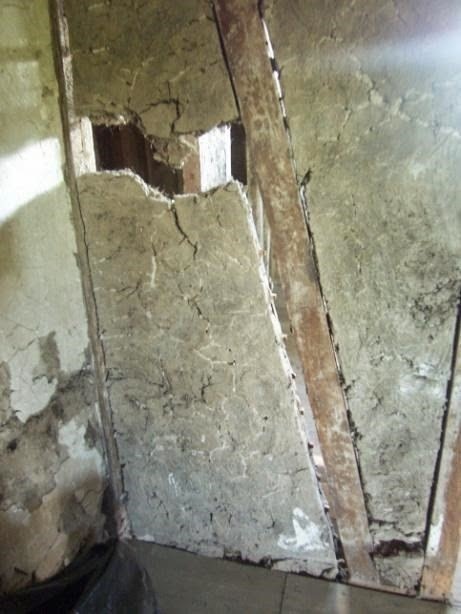 Bousillage is often misconstrued as insulation, when in fact it functions as thermal mass in the wall. In the 1990s, Cazayoux built one wall of his new residence with bousillage for its ability to retain heat or remain cold due to its thermal mass. He wanted to defy the contemporary opinion that you could not build in mass in a hot and humid climate successfully to create thermal comfort – something beautifully demonstrated by historic Creole homes. In his home bousillage is used in combination with a fireplace to provide comfort in winter as well as the summer. He described how the exposed bousillage cracks in the dry air of winter and heals itself as the humidity returns in the spring. In Louisiana‟s humid weather, Cazayoux noted, the ability of bousillage to act as a desiccant has a very desirable impact on the indoor environment. Pierrottie termed this function “Cajun air conditioning,” explaining how moisture that is absorbed during the day is released in the lower temperatures of the evening, producing a cooling effect. He concluded that he would like to see people recognize sustainable qualities of this material for new construction as well, a sentiment the authors of this report share. By bringing together materials analysis, building documentation, and craft practice interviews through the support of the Fitch Mid-Career Grant, we successfully created a new body of information about bousillage which will serve as the foundation for creating a primer on this nearly lost building art. The observation of Spanish moss bark residues in the materials analysis is a very significant finding and something that could only be achieved through microscopic analysis; demonstrating how this was a valuable addition to field study and interviews. Field survey of buildings served the important purpose of documenting the physical evidence of this building tradition for future generations and also offered new insights. Invaluable information gained from trial and error experience was recorded by the interviews and will serve as an excellent basis for developing technical guidelines and recommendations for bousillage construction. Now, the insights that formerly resided within the heads and hands of a few will be able to be translated to an accessible written form to assist any conservator, architect, homeowner, student, or other person interested in this topic. The next step in our on-going effort to create a published guide to bousillage will be the completion of additional interviews and analysis that will help to support or challenge the findings of this project. With this further information we will draft recommendations for materials and methodologies that we will then test with mock-ups and field trials. Field trials will allow us to observe and scrutinize the results of all the different methods suggested by our interviews, analysis, building study, and archival research. We will continue our efforts until we are able to accomplish all the work necessary to produce an informative and practical publication. Our enduring goal is not just to collect information, but to disseminate it to the public. barreau(x) – Fr. A small bar or stave. Used in this context to describe the wooden members which are fitted between the posts of the colombage, or timber frame, to support the clay and Spanish moss bousillage loaves. Barreaux are riven and roughly square, rectangular, or trapezoidal in section (depending upon how the fibers split) with tapered and pointed ends. They can be arranged horizontally, diagonally, or zigzaggedly. Also referred to as bâtons or rabbits in certain parts of Louisiana. baton(s) – Fr. Stick. In this context, barreau(x). Usage of this term is predominantly Cajun rather than Creole. batture – Fr. The land between a river and a levee, which could consist of a sand-bar or mud deposits. This term is commonly used in Louisiana to refer to the sediment deposit between the Mississippi River and the levee. As the river rises and subsides seasonally, the batture becomes flooded and drained. Craftsmen would harvest sand from the batture for mortar and plaster recipes as well as clay and sand for bousillage, if the structure was in close proximity to the river. briquette-entre-poteaux – Fr. Brick-between-post construction, in which the brick nogging is laid between the vertical members of a timber frame. bousillage – Fr. In the Gulf South, tempered clay and Spanish moss used as infill in colombage structures, as daub over the stick framework of chimneys, and occasionally as chinking. In French settlements of the Upper Mississippi River Valley and Canada, straw or hay, not Spanish moss, was used as the vegetal binder as in France. Acadian buildings of Nova Scotia also used marsh grass as the binding plant fiber. On early documents, the term appears as bouzillé or bousillé. It is uncertain when the term bousillage developed from bousillé. Also sometimes referred to asbousillage entre poteaux and bousillier entre les poteaux. In contemporary Parisian French, the verb bousiller means to ruin and the construction method of bousillage is known as torchis. One interviewee noted that visitors from Quebec said they use the word bousillage to mean making a mess. colombage – Fr. Heavy timber-frame construction; the framing of walls infilled with bousillage, pierottage, or briquette-entre-poteaux. garçonnière – Fr. Young man‟s quarters. In Acadian structures the garçonnière was typically located in the attic. In French Creole plantation architecture, young men often had their own upper floor wing of a home. This structure was frequently separated from the main house by a gallery. Sometimes, it was a completely detached structure located off the rear of the main home. gin – A machine that removes unwanted debris from fiber. Spanish moss is retted and cleaned of large debris by hand picking before it is ginned. The moss gin uses a toothed cylinder and fans to further clean it and prepare it for baling. pierrotage – Fr. A stone and mortar infill between timber frame construction used in French settlements of the Upper Mississippi River Valley and Canada, but not along the Gulf Coast where stone is lacking. poteaux-en-terre – Fr. Post-in-ground construction. poteaux-sur-sole – Fr. Post-on-sill construction. rabbit(s) – Barreau(x). Term used in the Natchitoches area; of uncertain etymological development. rez-de-chaussée – Fr. The ground level of a raised building. salle – Fr. Large general purpose room or hall. tâche – Fr. An in-ground pit used to make bousillage. tâcheron – Fr. Person who mixes bousillage by trampling in the tache. 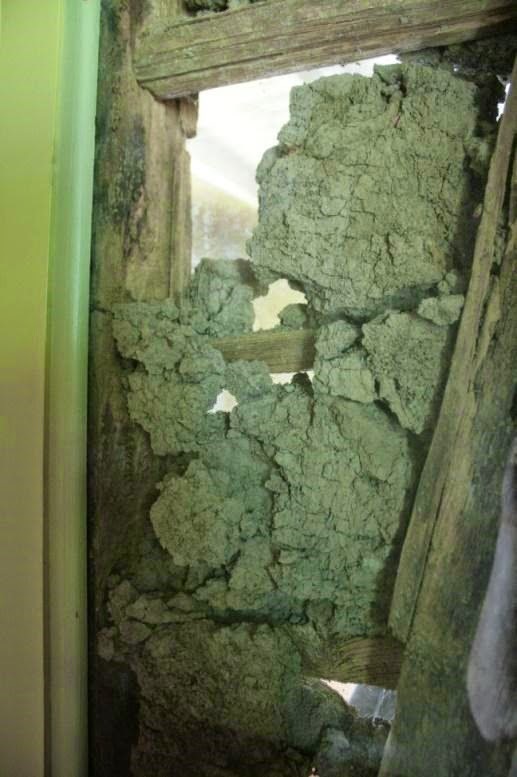 Graham, “Wattle and Daub: Craft, Conservation, and Wiltshire Case Study,” 15). Also torchon. torchon – Fr. A loaf of bousillage. In present day France, it is synonymous with mess like the current meaning of bousillage in Quebec (see bousillage). In seventeenth century France, a torchon de paille was a small bundle of straw or as much as a thatcher could lay at once (RandleCotgrave, A Dictionarie of the French and English Tongues, 1611). Also torchis. Charles E. Peterson, Colonial St. Louis: Building a Creole Capital (Tucson: The Patrice Press, 1993), 44. Claire K. Tholl, “Query Re. : “Filled Wall” Construction,” APT Bulletin 12, no. 2 (1980): 124-126. Giacomo Chiari, “Materials and Craftsmanship,” in Terra 2000, 8th International Conference on the Study and Conservation of Earthen Architecture: Preprints (London: James and James, 2000), 109. John J. Walsh, “Bousillage Analysis Report” (Highbridge Consulting, Ossinging, NY, 2010), 2. George Reinecke, trans., “Early Louisiana French Life and Folklore, Excerpts from The Anonymous Breaux Manuscript,” in Louisiana‟s Living Traditions, Louisiana Division of the Arts, http://www.louisiana folklife.org /LT/Articles_Essays/the_breaux_manuscript.html (accessed September 12, 2008). Torchis and torchons both refer to the loaves of mud and moss. Pierrottie says torchon while Cazayoux says torchis. Baguette is another term with the same meaning. Terminology varies somewhat by region.